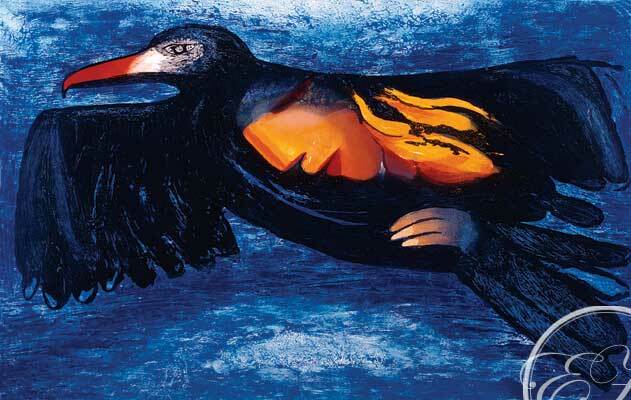 Charles Blackman released this limited edition Collagraph Fine art print titled Soulflight Circa1998-2000, it is one of the famous images from his collection titled The Orpheus Suite. The edition was limited to only 70. Paper size is 74cm x 105cm, there where 7 plates made and 40 colours had been used. This Collagraph titled “Soulflight” is signed lower right Charles Blackman’s poetic paintings of love and music, in this collection of 12 works form the Orpheus Suite Soulflightculminates in the psychic force of Soulflight, and depicts a strong image of the creative flight. Over the years there have been several other images from Charles Blackman released as Etchings and Limited edition fine art Prints.